Think you know a lot about books? 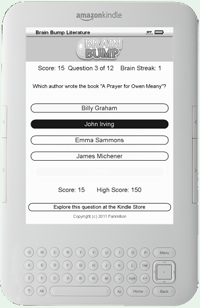 Test your knowledge with this simple, fun trivia game built exclusively for the Kindle Active Content platform. Easy to Learn, Easy to Play! Best of all, if you come across a title you have always wanted to read, simply choose to explore the question at the Kindle store. There you automatically get that title with a fast and easy download! Enjoy fast wireless delivery of this Kindle game! Get the newest version of Brain Bump Literature Edition from Amazon today for only $0.99 and start challenging your knowledge of literature today. Who the Heck is Fanmillion? Learn more about the company behind the game!